With people increasingly turning to social media to help make decisions, it’s never been more important for higher education institutions to empower students, alumni, and the community to adequately tell their stories and garner trust. Social media has changed marketing, and personal opinions have become much more important—so much so that some people even make their living influencing through social media, spreading messages and promoting products. Instead of marketing directly to a large group of consumers, you inspire, hire, or pay these influencers to get the word out for you. These key leaders will drive your brand's message to a larger market. By identifying individuals with the potential to influence attitudes and behaviors tied to key enrollment, fundraising, and branding outcomes, campuses can harness the power of peer influence for strategic impact. Have the trust of their community or audience. Drive discussion around key topics. Answer the questions everyone is asking. Are highly engaged with their community. Influencers can be a great way to spread your school's message, build your brand, or promote fundraising. Today, college students see "online influencer" as a viable alternative to part-time employment. Some may arrive on campus with tens or hundreds of thousands of followers, and you can bet they'll be sharing their experience on campus. If you have an influencer marketing strategy, you can find and collaborate with these students instead of waiting to see what they say about you. Institutional Communication: The traditional work marketers and recruiters do day in and day out—and the research on this subject specifically identifies web content, advertising, and print communication as influential. Student-Related Factors: Many practical determinants affect college admission, such as academic ability, test scores, GPA, and cost, as well as demographics and socioeconomic status. Greater Social Environment: This factor differs from the first two in that the findings are less clear on the impact of social environment on college choice. Family influence is fairly well understood by researchers, peer influence is not—particularly when adding social media to the mix. Signs indicate that peers influence college choice similarly to general consumer choice, but the research hasn’t had time to catch up and come to a consensus on this. With social media emerging as a college choice influencer, indications tell us that peer influence and social media are more and more important in the higher ed marketplace. This means that the people, personalities, and stories represented through social media are influencing students, alumni, and the community. Two areas that benefit from well-executed influencer marketing are recruitment and fundraising. Here's how you might apply the influencer marketing goals to the functional areas of recruitment or fundraising. Amplify the voice of recently admitted or matriculated students within a high school, community, or workplace. Tell a better story of the variety of experiences offered at your institution. Partner with key local or industry influencers to reach a new geographic location or prospective students in a specific graduate program. Increase mindshare through influencer affiliation in highly competitive markets. Highlight the results of alumni giving and encourage a sense of ownership from alumni donors. Equip alumni with stories that resonate with their social networks. Increase the giving rate of young alumni. Increase philanthropic mindshare of alumni during end-of-year giving appeals. In addition to the strategic benefits of influencer mareting, Mark Schaefer identified seven tangible benefits of influencer marketing in his book Return on Influence. Here's how these benefits apply to higher education. Reach and awareness: Influencers have a built-in audience—the reach of an influencer can provide access to prospective students who don't respond to your outreach or alumni who haven't engaged with you. Research: Influencers can act as a very engaged focus group who can tell you what’s working and what’s not. They’re a fantastic feedback loop that you can count on to provide quick responses to ideas for campaigns and messaging. Content ignition: Influencers serve as a connection between your great content and their audience, and can secure more eyes on the content you’ve created for that specific audience—even evergreen content. Influencer marketing can support your strategic goals. Our best practices and additional resources help you integrate influencer marketing into your current strategy. Site authority and SEO: Influencers can also help you create content that mentions your brand alongside certain terms on their own websites and social media posts. If you’re building any web properties from scratch, this can help you rank early for the right things. Strategic leverage: If you’re in a highly competitive field (say, business schools or niche academic programs), getting the right influencer on your team can be a strategic move. If you have influencers, it's likely that your competitors don't. Cost savings: Influencers are individuals, not corporations. A couple hundred or thousand dollars means a lot more to them than it does for your media buyer. As you track your influencer marketing programs, you’ll likely see that the ROI is much higher, and your cost per lead or impression is a lot lower. Authentic advocacy: The best influencer marketing pairs a brand with an influencer who is legitimately happy to talk about the brand because they feel it provides value to their audience. Find more episodes of The Sonarian Sitdown in our Resources. If you're convinced that influencer marketing is the way to help you reach your goals, we can help you find them. One way to identify potential influencers is to use online conversation insights. Depending on your goals, choose a topic or target audience. Think about if you're looking for influencers with authority on a particular topic, or if you're trying to reach a certain demographic. Get in your audience's head and clarify what they want. You can use social listening to understand what your audience wants. Ask what/who/why questions. What questions are people asking? Who is asking them? Who is new to the conversation? Who has been a long-term participant? Who has an impact on the conversation? The answers to these questions will help you identify key influencers. Once you identify your influencers, they can become social media ambassadors on your campus. Some influencers may arrive on campus with a strong following that you can leverage. Finding these influencers and creating opportunities to collaborate with them will strengthen your authenticity and increase your audience engagement. 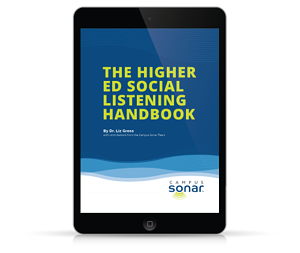 Learn the ins and outs of influencer marking, as well as everything else related to social listening for higher education in our eBook—The Higher Ed Social Listening Handbook. The handbook walks you through why social listening matters in higher education along with key metrics, how-to guides, and over a dozen campus case studies related to influencer marketing and much, much more. Download the book today and start implementing social listening strategy on your campus.